Home of the world's largest geysers - the Steamboat Geyser. Norris Geyser Basin. Geology Sheet XXI. 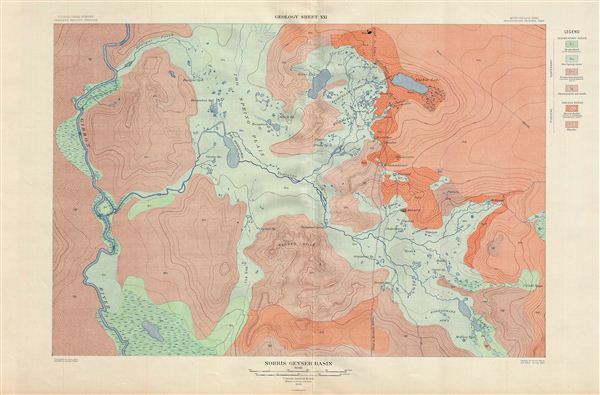 A fine example of Arnold Hague's 1904 topographical survey map of the spectacular Norris Geyser Basin in Yellowstone National Park, Wyoming. Centered on Tantalus Creek and the Reservoir (100 Spring Plain), the map covers the basin Gibbon River to Nuphar Lake inclusive of the Porcelain Basin, Sieve Lake, the Gray Lakes, and the Ragged Hills. Identifies numerous Geysers throughout. The Norris Geyser Basin is home to the world's largest geyser, the Steamboat Geysers, which can reach 380 feet during its rare eruptions. This particular map was part of Hague's study of the regions unique geology and the related geothermal activity. The map is color coded to indicate geological zones with a legend set in the upper right quadrant. Published by the United States Geological Survey in 1904.